A weekly newspaper has launched a campaign to raise just £30 per week to keep a police presence in its local area – and offered to pay for the first month from its own coffers. The Hampstead & Highgate Express has offered to pay the paltry weekly amount to fund a new base in Hampstead because Scotland Yard has barred officers from spending £30 from the borough’s policing budget to rent a charity’s premises. If the amount of money raised is not enough, the Ham&High has offered to make up the shortfall. The Met is concerned about setting a London-wide precedent, despite the fact that the money was already allocated and the deal ready to be inked. Its decision comes as the sale of Hampstead Police Station is expected to raise a rumoured £30 million, following its closure in June. A £30 fee would cover the cost of renting a room at the Old Hampstead Town Hall from arts charity Wac Arts, for a new “contact point” to replace the station. “We won’t see them short of their rent,” said Ham&High editor Geoff Martin. The move has also been backed by London Mayor Boris Johnson who has vowed to look into Scotland Yard’s decision. “It sounds mad to me. I will look at the problem and we will see what we can do. I’m glad the Ham&High have drawn it to my attention,” he told the paper. The contact point would be manned three times a week, for an hour at a time, giving residents the chance to speak to officers. Scotland Yard’s decree was issued after Hampstead’s officers had already spent months scouting for a suitable location for the contact point. The old town hall in Haverstock Hill was identified as the perfect option, having received the most visitors and best feedback after a trial. 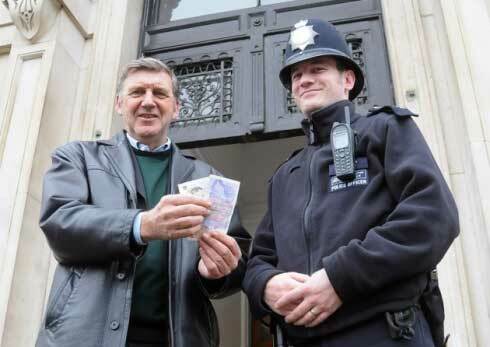 Be careful about being pictured trying to give a copper money!!! Elveden are watching!